No one can fathom Baba's leela ,sitting in one place He was present everywhere and taking care of his children . Shri Jahangir Framji Daruwala served as a Captain. During the Russo-Japanese war, when his steamers except three sunk by the enemy and that the rest of the steamers including his own would soon meet the same fate. He took out Baba's photo from his pocket and with tears in his eyes prayed to Baba to save him and his three ships. 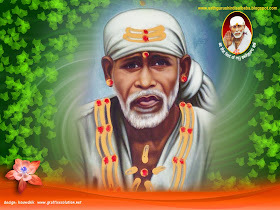 Baba at once appeared on the scene and towd all the sinking steamers to the bank. Just at the time Daruwala offered up his prayers, Baba bailed Out and then seated as He was in his usual place in the Dwarakamayi. He had his Kafni and head cloth completely drenched dripping with water more than half an hour, with the result that the Dwarakamayi transformed into a pool of water. The devotees in Dwarakamayi simply removed water from the Dwarakamayi and dried Baba's clothes. On the third day after this incidence, Baba received a telegram from Jahangir narrating how Baba had saved him and offering Him a thousand thanks for His marvelous leela and rescue of himself and the three steamers with passengers. Immediately on his return to India, he came and paid his respects to Baba, He had retired now from his service. But in appreciation of his services, the Government had provided him with job. He has taken keen interest in Baba's affairs. He donated about two thousand and two hundred rupees in two installments and got the Mandap of Dwarakamayi repaired to his satisfaction. 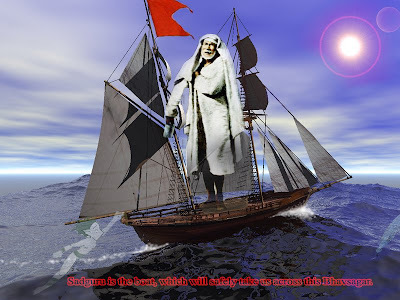 Sai Baba the Saviour of Ganesh Murti.